The transmitted photograph from the Martian surface combines a series of high-resolution circular images taken by the Remote Micro-Imager (RMI) of Curiosity’s Chemistry and Camera (ChemCam) instrument with color and context from rover’s Mast Camera (Mastcam). Curiosity snapped the images during the 640th Martian day, or sol, of Curiosity’s work on Mars – May 25, 2014 back here on Earth. 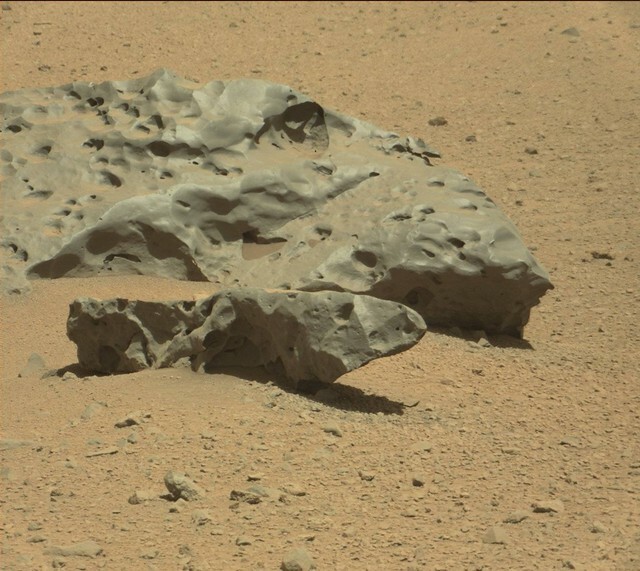 The imaging shows angular-shaped cavities on the surface of the rock. One possible explanation is that they resulted from preferential erosion along crystalline boundaries within the metal of the rock. Another possibility is that these cavities once contained olivine crystals, which can be found in a rare type of stony-iron meteorites called pallasites, thought to have been formed near the core-mantle boundary within an asteroid. While iron meteorites are fairly common on Earth, on Mars they are by far the most common types of meteorites that have been discovered—if just for the sheer fact that they are highly resistant to erosion.